Here are mine, wrapped up in this cute little package called ‘The Little Bliss List!‘ Join in on the fun and scatter some joy! 1. Celebrating a big week in my husband’s life: a musical baby! 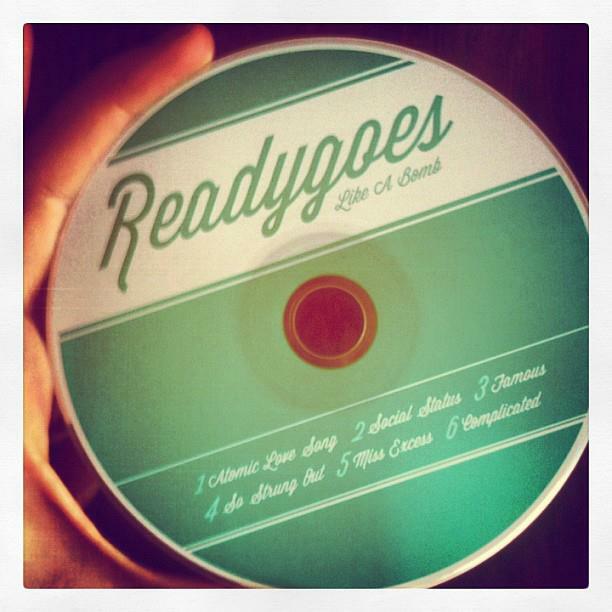 Check out ReadyGoes (my hubby’s band) new EP, “Like A Bomb”. It’s even in turquoise! Too cool! They’re celebrating their new release at The Varsity Theater (a historic theater in the heart of Dinkytown, Minneapolis that was renovated into a plush and retro-licious event and concert space…fun fact: we were married there, here’s proof!) this weekend. Can. not. wait!!! It’s a fusion of vinyasa and strength training. Think: lots of warrior moves (static lunges) with weights, a bit of cardio and core topped off with lots and lots of sweating…the room is heated (!). Yes, sometimes I want to give up and I check the clock a little too much, but I always end up leaving refreshed and STRONG! Plus, I love the feeling of being sore after a workout…that way I really know I’ve accomplished something. And so do the ladies of the website, HelloGiggles! It’s an online community aimed at women in hopes of spreading positivity through the Interweb (we all know there is always room for more positivity!). It’s a space to have fun, learn how to drink tea like a Brit, look at photos of cute puppies and of course, giggle. Check it out…there really is something for everyone! I’d like to do yoga but I think I better stick to my deep water aerobics. Can you believe that I have actually pulled muscles in the pool? Have a great weekend, Ruth! Your yoga workout sounds a little intense for me. I do a 20 minute yoga workout every morning; just stretching and relaxing. Good bliss list. I love any type of yoga and it’s awesome there is so much variety! Thanks, Pat!